Sotheby’s may be one of the world’s most venerable brands, having dominated the fine art auction sector worldwide since 1744, but that venerability doesn’t mean that the almost three centuries old brand is sitting out the digital revolution. On the contrary, Sotheby’s is undergoing a digital overhaul incorporating user experience, eCommerce and digital product design into the heart of its art market operations. Online auctions, frictionless ecommerce platforms and user-centric design are all within Sotheby’s sights for the near future. 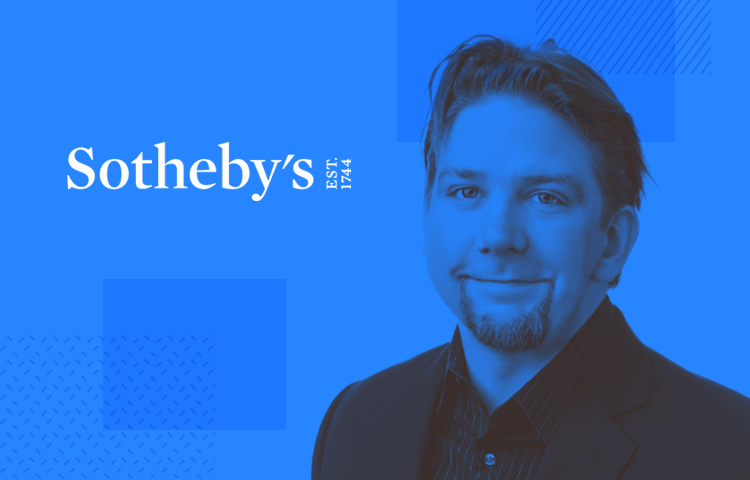 The man in charge of leading the UX charge at Sotheby’s is Head of Experience and Product Design Chris Daly, a former front-end guy turned Experience Designer. Chris spends his days getting inside the minds of Sotheby’s customers, evangelizing UX across the global enterprise, and prototyping user-centric design solutions to support the brand’s digital transformation. We chatted with Chris to find out what it takes to introduce a UX mindset into a heritage brand, his tips for enterprise UX workflows, and how prototyping helps his team bring digital experiences to life. What’s an average day in the office like for the Head of Experience and Product Design at Sotheby’s? Sotheby’s is a really fascinating company from a product design standpoint. As old as a company we are – we’re 270 years old – and as revered as a brand we are, the digital side is still immature. So there’s a tremendous appetite (from executive levels and from a client standpoint) for us to be more responsive and receptive in using digital channels to engage and provide experiences, and provide opportunities to evangelize who we are. So my day mainly consists of just trying to stay on top of a huge tide of energy in order to move Sotheby’s towards a more digital-first mindset. Most days are spent in 4 different areas of activity. I report to the executive layer, so every day I report up to CMO and Chief Digital Officer David Goodman. Then I’ve got a team of 6 people in the design team, and we’re part of a larger 20 person digital product group. I work with them on moving individual product lines closer to fruition, or maintaining or even improving them. The third part of my job is interfacing with various areas of business is in our company: Sotheby’s has a lot of departments almost like mini fiefdoms specific to genres of art and collectibles, and each one of these groups has their own auctions, mindset, sales and client base. It’s part of my job to help understand how each one of these different groups does business and then help to sell in the solutions that we’re designing. And then the last part is trying to keep abreast of the perspective of our clients and customers, and get a real sense of our customer voice. We have ongoing input from surveys and from client touchpoints, site analytics and data to peer into the minds of our customers. There’s a lot to do! As you mentioned, Sotheby’s is a venerable brand working within traditional, low-tech sectors like the art market. Who is driving the motivation for digital transformation? Does the demand come from users or from the C-suite? I think it comes from both. The digital art market is thought to be worth about $3 billion (when I say digital art market I mean the art market on digital channels) and by 2020 it’s predicted to be $9-10 billion business. So we know that there is a desire for art on these types of channels. That’s because the world is globalizing, and Sotheby’s doesn’t just sell major pieces of art work to urban audiences in New York and London. That’s the way things used to be but money, influence and desire for these types of objects are distributed. We can’t expect high-end clients and collectors in Asia to stay up to 3am to participate in an auction. We need to be responsive to where our clients are geographically, and the best way to do that, both from a client perspective and a C-suite perspective, is through digital means. This year 95% of our business will come from live auctions that have a digital element, for example the ability to participate via a web app or phone app. But increasingly we’ll have online-only auctions that aren’t just 2 or 3 hours long but 2 – 3 weeks long, providing a greater access point for people globally. I think that’s the direction that the world economic system is going and we need to be part of that. Download Justinmind and prototype digital products now! When you say auctions that are online, most people will think of eBay. Can you tell me how you’re differentiating the UX of a Sotheby’s auction to the experience on eBay, a completely different kind of auction site? From a structural standpoint and an actual commerce standpoint, they’re identical. When we say we’re going to do online auctions and someone says “oh, just like eBay”, we say “yes!” But we’re not selling $10 objects we’re selling $10,000 prints. So does that mean you encounter resistance internally in Sotheby’s to introducing these kinds of ideas? The critical factor for us in introducing online auctions is make sure that we maintain the sense of what an auction is. An auction isn’t just a bunch of stuff that you raise your hand and say you want. An auction is a themed event that has a beginning, middle and end, that is a curated collection of interesting material and in and of itself can tell a great story; the best auctions we have tell the best stories. We just had an online auction that made about 2x more than our previous online auctions, and that’s because it told an amazing story. This collection was significant because it wasn’t even going to be big enough to be its own stand-alone auction – it was a collection belonging to one individual – but it made a whole lot of sense to do it online. It ended up being a gangbuster sale. Can you tell us about the process of creating apps and sites for these online auctions? What we know for a fact is that our buyers and bidders are upwards of 33% more likely to transact with us if they consume some of our editorial content. So our app design and site design is increasingly a marriage between curated editorial and traditional commerce and auction methods. Our Sotheby’s app is editorially focused: you can see everything that’s for sale and you can see every single auction, but our first generation of apps is not transactional. This is partly by design and partly a consequence of us being in the middle of up-ending our full technology set. But what’s interesting about the apps is that they’re the only house auction apps that have a real editorial, almost magazine feel to them, and I think that’s what makes them special. Can you tell us where prototyping fits into the design and development process at Sotheby’s? As of a month or two ago, prototyping is primary to our process. If we had had this conversation a year ago our product team would have been 3 people, and it wouldn’t even have included me because I started in January. 18 months ago there was no product team, and now we’re 20, and a year from now we’re going to be 40. So our ability to develop products is increasingly driven by how quickly we can develop ideas. As of January, we’re never going to present flat wireframes again, we’re only going to present prototypes, whether to internal teams or to business leaders and stakeholders. Flats just don’t do it anymore. We can look at beautiful pictures all day (that’s what Sotheby’s is all about!) but digital experiences are about animations and transitions, and you simply can’t do that in a flat wireframe. I look for robustness in a prototyping tool. There’s a bunch of prototyping tools out there that have an ease-of-use and simplicity selling proposition. Those are stupid easy to use, but the downside is that they’re not comprehensive enough to add the real polish that a digital experience needs to have. You can find great flat UI designers all day; what you don’t often find is people who think past that tableau or screen and see an entire experience, how screens build how modules move, how shadows dance and create delight. I come from the agency world, so I spent two thirds of my career agency-side producing large scale UX documents – absolute tomes of detailed requirements, specifications and functions. Those types of documents still have a role to play, but to get buy-in for a product (whether from stakeholders or from the internal team, prototypes beat documentation. I could show you a flat and describe to you the animation, or I could actually show you the animation. And one of those is certainly a lot better than the other! What inspired you to become a UX professional? A complete happy accident! My college education was in Communication Theory and Expression – I was big in speech and debate in college, and right after college I worked as a speech and debate coach at Cornell University for a while. This was right at the time the commercial internet was starting to mature, and it seemed evident that this was the next generation of communication. So I went to NYU and stated a grad program in Interactive Telecommunications, and then sort of went from there. My first jobs were as front-end web developer, and I had the misfortune in one meeting to suggest moving something on a page from left to right, and suddenly I was an experience designer! It took off from there. I felt right from the get-go that this was the job for me because it was a really interesting mix of having to be a design thinker but also having to speak both business and technology. I loved creating interesting moments for end customers and clients that added value to their lives, proved a business point, and demonstrated interesting technology all at once. What advice would you give to graduates looking to get into the field? The key advice is UX isn’t just interface design. It’s not just pretty pictures or even what an app feels like. You need to think holistically from the client perspective. What value does this app add to a user’s life? What’s the overall journey? What’s the interaction between the app and a company brand? And what’s the ongoing relationship and lifetime value created between a user and a brand via these apps? That’s what UX is all about. Intrinsically UX is a strategic initiative where you have to see the whole picture and you have to see end to end. I think increasingly this current generation of UX professionals are pigeonholed as design professionals, but I’m an advocate that experience professionals need to have a business and strategic mindset in order for products to become an important part of the eco-system of a company. Tell us one prediction for UX and product design in the next 5 years. User experience shouldn’t just be about pretty pictures because increasingly those pictures are going away. People talks about GUIs, but the next generation is the VUI, the Voice User Interface. It’s here now – think of Siri and Alexa. Intrinsically, how you’re interacting with those pieces of machinery, how those machines are responding, how the AI is working behind the scenes, that’s all experience design. It just doesn’t happen to be graphically focused. Within 5 years that’s going to be the primary way that these apps are going to work, and brands are going to engage with their clients. Things will be so much artificially smarter and anticipatory. That’s not to say that experience designers are going to be out of work! But it’s going to be less around the user interface and more around its intrinsic value in the overarching experience. You can’t just be a designer of pretty pictures; you have to see the role a product plays in the life between the user and the brand.